“Design is one of the most powerful forces in our lives,” according to Alice Rawsthorn, author of Hello World: Where Design Meets Life, a book of essays that examines the role of graphic, product, and interactive design in our life choices. “Design can empower people,” she says. What about your graphic design? Do you view the design of your printed materials as simply a way to communicate with clients and potential customers? Or do you view your design as a motivating force to empower potential customers to action? Regardless of whether you run a multi-million-dollar corporation or a local small business in downtown St. Louis, you have a tremendous opportunity to empower people and grow your business by printing materials in St. Louis that include effective graphic design. Here’s how. Graphic design is about more than just what looks good. Your favorite color might not be the best representation of your brand. Your logo is most likely the first impression a customer will have of your brand, and it should be on everything: brochures, letterhead, banners, and signage. What brand attributes do I want my logo to convey? Is my brand trying to evoke a particular emotion or function? Choose graphic design that is not overly trendy. Once you’ve established an effective brand, you want to get many years out of it. But brand goes way beyond logo design. Your brand is your voice. Think of it as the message you want your graphic design to convey. What are your favorite brands and what makes them effective? For example, the Nike “check” symbol represents more than a shoe company. It represents quality, athletics, achievement, and success. Similarly, your graphic design should visually speak to customers in these three ways. Your brand should explain the benefits of your product. Think past the functional benefits. Does your product bring pleasure, save money, or bring a level of security? If so, build your brand around those benefits. For example, use your brochure to show the benefits of your service through imagery and well-worded customer testimonials. Explain what you promise through your brand. Obviously, your promises include the features of your product. But it also includes your promise to deliver superior service or guaranteed satisfaction. Do you have unique ways of adding value? Most likely, customers can buy a similar product from a competitor. Does your brand empower them to buy from you by communicating added value? Tell customers how you feel about them through your brand. Imagery used in your printed materials and online convey how you feel about your customers. Do you go above and beyond to satisfy? Do you continue to nurture customer relationships after the sale? Use graphic design to communicate those messages. Grab your potential customers’ attention with well-designed brochures; they’re a good sounding board to express how you feel in a visual way. Talk about your history and explain your view of customer service. Once you’ve defined your brand, focus on the creative aspects of your graphic design. Constantly refer back to the brand traits you identified earlier, each time you design a new piece of your marketing campaign. You want to consistently communicate the same message and reinforce your brand again and again. 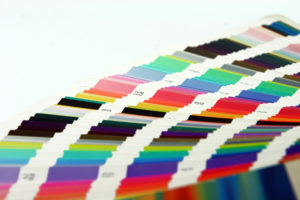 Let your brand personality guide everything, including colors, word choice, font style, photo placement and logo design. For example, is your brand friendly and personable or high tech and modern? Font choice will play a huge role in communicating those traits. This is especially important when you are designing items that are meant to be read from far away, such as banner displays or advertising flags. Car magnets are a branding technique that is effective when implemented with strategic graphic design that is simple but memorable. Making your design too complicated will result in drivers not having enough time to read it and get the point. You want them to glance at your magnet and immediately get your message. Does the layout in your promotional materials send a clear message, empowering the customer to act on what she hers? Here are some tips to make sure that happens. Don’t use more than two fonts. Customers often scan materials instead of reading every word. Make it easy for them to get your message by not cluttering up the space with multiple fonts, colors, and sizes. Don’t use more than a combination of two fonts, including size, color, or two totally different font types. Readability is often governed by the spacing between lines, words, and letters. Whether you are designing a long brochure with a lot of text or a direct mail postcard with very little words, the customer should be able to scan the document and know what it’s about within 10 seconds. Proper spacing will accomplish this. The more white space, the better. Be consistent. Consistency fosters familiarity. For your brand to be recognized, be consistent, even with your fonts. Think about Coca-Cola. The soft drink powerhouse has been using the same script font since 1885. Why? Because it’s recognized internationally. It stimulates a feeling of nostalgia and youthful vigor. Does your font speak to your customers like that? The various elements of graphic design, such as font size, color choice, and image placement seem fairly straightforward. However, using design elements that communicate your brand and motivate customers to use your product is where art meets function. Reach customers in St. Louis through effective graphic design.